Eye On Sports Media: NBC Sports Offering Up Christmas Day Airing of Sasha Cohen and Evan Lysacek at "Improv-Ice"
NBC Sports Offering Up Christmas Day Airing of Sasha Cohen and Evan Lysacek at "Improv-Ice"
Ice skating on Christmas Day sounds very inviting on a cold Christmas day. You know, huddling around the TV, drinking hot chocolate, a roaring fire in the fireplace, chestnuts roasting, watching figure skating. OK, not in my house as the kids will have control of the remote as the parents prepare dinner. Plus it does not get that cold in the South. But for those that do like this image, NBC Sports will be showcasing Sasha Cohen and Evan Lysacek at "Improv-Ice" at 3:00 PM ET. The event was taped on October 6, 2009 at the Honda Center in Anaheim, CA. NEW YORK - December 21, 2009 - Olympic and World figure skating champions offer a holiday treat of spectacular skating featuring music by the Grammy Award winning Goo Goo Dolls for “Improv-Ice” on Christmas Day at 3 p.m. ET from the Honda Center in Anaheim, Calif.
“Improv-Ice” will require each skater to perform two routines to one contemporary song and one Goo Goo Dolls song with out hearing the music first. The audience gets to vote on the best performance and the results will be announced at the end of the show. 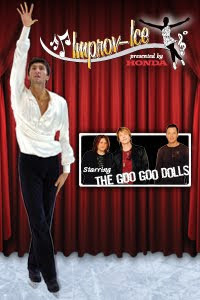 This show features an all-star cast of Olympic, World and National Champion skaters including 2009 World Champion and newly crowned Grand Prix Champion Evan Lysacek, 2006 Olympic silver medalist Sasha Cohen, two-time Olympic Medalist Nancy Kerrigan, four-time World Champion Kurt Browning and three-time U.S. National Champion Michael Weiss. Hosting the event are Olympians Kristi Yamaguchi and Brian Boitano.